The key message from Fatima is to join in one mind and one heart in the Hearts of Jesus and Mary and be united at every moment to the Mass. We unite all our sacrifices to the Holy Sacrifice of the Mass, all over the world. In our days we are called by Mary and Jesus to look at her message at Fatima. Before Mary appeared at Fatima the angel appeared and gave messages. We were told to pray for those who do not believe, do not adore, do not hope and do not love as they should. In every rosary we pray on the first 3 Hail Marys for faith, hope and love. Pray for this. On October 13, 1996 Jesus told me this was His help in the completion of the Fatima message. He called us to meet October 13, 1996, November 13, 1996, December 13, 1996 and then on December 17, 1996 Mary appeared in Clearwater in Rainbow Color on the bank building. On that same day a Red Rosary Book with rainbow � Rosaries from the Heart of Jesus and Mary left the printer. This book had rosaries from when Mary had appeared to me daily beginning July 5, 1994 for 14 months. This book has these very important rosaries, led by Fr. Carter, S.J., they were given live and recorded, transcribed discerned by Fr. Carter, and put out in hard copy and on disc exactly as they were received that day. Life is very short and God calls us to help in the work of redemption. 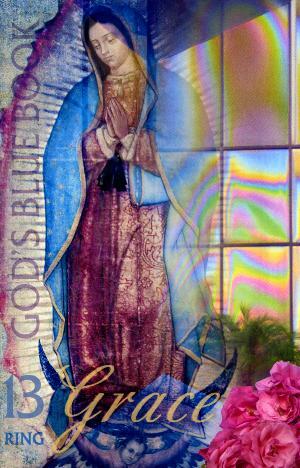 How are we in listening to this message of Our Lady of Clearwater. Jesus gave me the All Night Message at the end of Blue Book 13. This message really puts it all together. Given December 29, 1996, (12 days after Mary appeared in Clearwater) the message puts together the plan of God the Father, Jesus and Mary as given to me for the completion of the Fatima message. Mary had appeared to me on the 5th for 2 1/2 years, then on December 5, 1996, instead of Mary appearing Jesus appeared at Holy Cross-Immaculata, December 5, 1996, on the cross at the point of death. His mouth was moving, but no words came out. In the 5th rosary I received that night at my house Jesus said - He appeared with His mouth moving at the point of death because no one was listening. This rosary was led by Fr. Carter, S.J. and recorded on a tape before a very large group of Shepherds of Christ members. This rosary is included in this book.